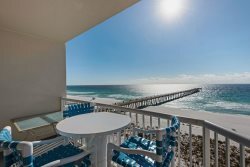 Inn at Summerwind 204E is newly redecorated beachfront condo. The soothing newly redecorated interior offers you comfort while the white sand beaches and emerald waters just beyond you balcony offer you a beautiful place to relax, play, and have "No regrets". Condo has keypad entrance. There is complimentary WiFi, cable and phone. The condo has two flat screen TVs and a fully equipped kitchen with NEW appliances and granite counters. Ceiling fans in the living room and bedroom. The private balcony offers a place to enjoy your drink while you watch the dolphins, early morning surfers, fishermen on the pier, and the shell collectors all starting the day on the sugar white beaches. The longest pier on the Gulf of Mexico is just a short walk away as are the two restaurants on the beach. If you are feeling more active you can walk , run, or bike along the paved pathway that goes for miles. It is just a short walk to to bicycle, wave runner, and pontoon boat rentals. Hidden Creek Golf Course is just off of Scenic Highway 399. Three pools and three hot tubs are on premises and also a well-equipped exercise and fitness room. Yoga sessions and pool aerobics during the Snowbird season are available almost every day. Navarre Beach State Park is o the East and Santa Rosa Sound to the north. Both are just walking distance away. Gulf islands National Seashore is a short drive away with miles of bike and walking paths. You are only 20-40 minutes away from the tourist attractions in Pensacola and Destin. Fantastic experience. This particular condo was just remodeled according to the paperwork and it did not disappoint. The place was picture perfect. Everyone was so kind and helpful! And super friendly!! Everyone was nice . Wonderful place to stay. This is my new favorite place to stay on the beech!!! We have been coming to the Florida panhandle beaches for 30 years, and this was our best trip so far. The view and the easy access to the beach from this unit were perfect. The condo is very well built, and it felt very roomy. We love Navarre- the traffic is not a problem, and grocery shopping is very convenient. Being next to the pier is a big plus- you can walk out for a dollar. We will definitely strive to rent this unit for our next trip. Everyone was very friendly and knowledgable. The property was very well taken care of and the staff was so friendly. Great stay... will definitely come back!